Determine the influence of air filtration devices (a.k.a. HEPA filters, air scrubbers or negative Air Machines) on Water Damage Restoration projects where air movers have been deployed. 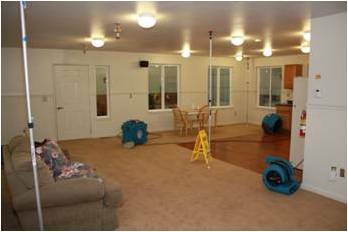 Utilizing air movers in a structure will impact the indoor air quality both during and after the drying process. Turbulent air will disturb particluates and spread them throughout the structure. Particularly when restoration procedures are invasive (e.g., floating carpet, using inter-air drying, demolishing structural assemblies), both the particle volume and type will besignificantly altered in the air space during the use of air movers. This presents a risk to both workers and occupants. Using air filtration devices during the restoration process will significantly reduce the particle load during and after restoration, thereby mitigating this risk. Monitor particle loads at several locations throughout a space where airmovers are being used in a fashion typical of a restoration project. Compare identical spaces both with and without the use of air filtration devices. Analyze and corroborate any deviations noted between multiple samples to understand the influence of air filtration during the drying process. This study confirms that the presence of air filtration devices during the process of drying is indeed beneficial. 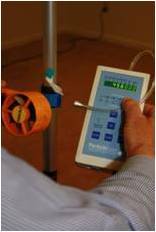 During a drying event, undesirable particulate loads in the environment are at a significant risk of being elevated. Particulate present in the indoor environment is likely to come from spaces that are not normal in the breathable atmosphere within the structure, as air is moved over affected structural materials, beneath flooring, in wall cavities, and across other damaged materials. As these foreign particles are released into the air, this study indicates that those particles are (1) distributed throughout the space and (2) deposited on surfaces. Particulate loads in both the air and on surfaces, especially when considering the potential sources, create a concern for both occupant and worker health. The use of air filtration devices will eliminate the majority of this problem, as much as 85% in just one hour of operation. Further, after drying (air movement) is complete, this study suggests much of the particulate deposited onto surface is likely to be reintroduced to the air, making it an even more significant risk to worker and occupant health. one of two test areas.